Picture yourself coming home from a long day at work. You’re sluggishly sitting down in your recliner gazing out the back window. Now imagine seeing a pond in your backyard from this same view. You feel inspired by your water garden’s beautiful qualities as it soothes you with its tranquil sounds. Your koi fish begin perking their heads up as if they’re waving to say hello. It’s the perfect way to find peace and de-stress from your busy life. Location, location, location! 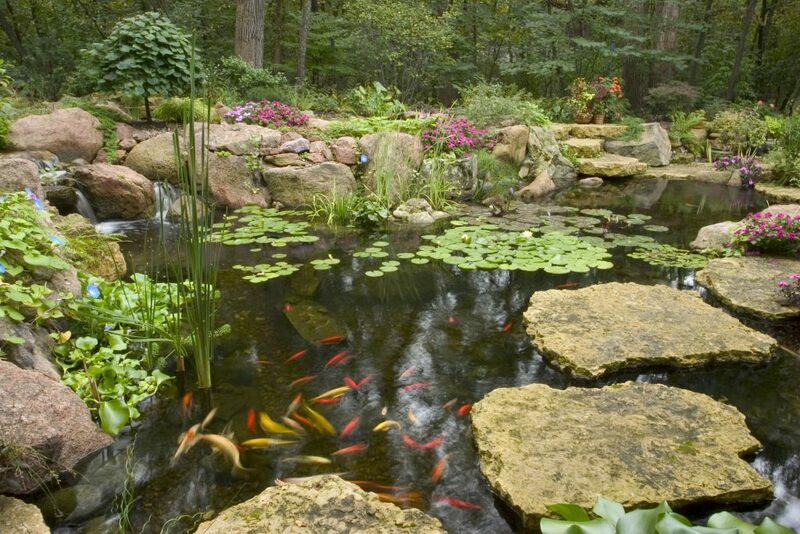 It’s crucial to find an ideal spot for your pond. Think about what made you want to get a water garden in the first place: hearing the soothing sounds of a cascading waterfall from the comfort of your home, lounging in your favorite chair watching the koi fish from the patio, and being able to entertain family and friends with your water features. For those reasons, you’ll want to choose a site near your deck or patio. All too often, people are under the impression that a pond should replace an unused space in their yard. These empty spaces don’t see much action for a reason. They’re usually in uninspiring areas far away from the house and where family and friends congregate. Waterfalls cascading into a pond look and function best on higher ground, so it’s best to put your pond on slightly elevated terrain or a natural slope nearby your hardscape. Avoid low-lying areas as ponds built in sunken areas can experience problems when groundwater builds up underneath the liner. You might think larger water gardens require more maintenance in comparison to the more modest ones. However, larger features are more stable due to the greater volume of water. Most pond owners end up expanding their water garden down the line anyway, so don’t sell yourself short on the initial design of your dream pond. Chances are you’ll want to make it bigger so you can enjoy more fish and plants. Strategically placed water features and plants help your man-made pond achieve the natural look of a real water garden that’s resided in your yard for years. Doing this right means adding a generous amount of pond plants like Taro, waterlilies, pickerelweeds, and other bunches of greenery to coincide with the smooth stones along the edges of your pond. Colorful flowers and perennial plants surrounding your water features are also helpful. They create interest to the finer details of your pond, such as the landscaping and the height of the waterfall. Be sure to consider all these recommendations in the design process of your dream pond. Before you know it, our pond professionals will turn your backyard dream into a reality!